I was in an exchange the other day with some folks talking about their perspective that all companies need to be using cloud computing. I agree, but my view is slightly different. My perspective is that depending on the company’s size, needs and applications they will likely continue to have in house systems. It’s not a choice between things, but a choice among things and an acceptance of the way things are and one answer doesn’t meet everyone’s needs. You can’t look at it as: clouds the answer, now what’s the question? Mobile computing is similar. It is the future interface of the enterprise, not really something special anymore. Embracing mobile devices and cloud computing will have a game changing effect, but it is not about the infrastructure but what we do with them and people want to do those things everywhere. There are a number of other trends taking place like the IoT that are also shifting how organizations think about computing. It is interesting how this term is changing and how various organizations are trying to name it. It used to be ubiquitous computing, some call it ambient computing, but most still use the Internet of Things. In any case the aggregation of sensors, devices, intelligence, and agents will shift how organizations generate value and shift IT to focus on systems of action. Many still look at these opportunities primarily from an infrastructure perspective, but I definitely do not. It is about the business and the hardware side is a small (but necessary) part. Organizations that will compete effectively in the coming years are going to shift their thinking to “and” and not “or” foundation. It is not all about IT, but IT has a role in enabling this flexibility. By the way the output of the And not Or logic circuit illustration is always a one –> true. Having recently gone through a personal disruption related to employment, I dusted off my copy of Who Moved My Cheese? After re-reading the book, I thought about how this applies to the life of the CIO and application portfolio management. We are all too often with the world we understand and the 80% (or more) of the budget it consumes – failing to Sniff out opportunities. Recently there was a post: CIOs make the tough call on legacy systems by Mary K. Pratt that delved into the issue of managing the layer upon layer of project success that builds up to calcify an organization’s ability to respond, that I found a worthwhile read. Even in this day of IaaS and SaaS, the basics of optimizing the application portfolio of an organization remains relatively unchanged. It gets down to where the organization is headed and an assessment of costs vs. value generation. What needs to be done and why? How is it going to be accomplished? When will it be needed or done? How will we measure outcomes, so we can validate that the task is complete and effective? Essentially an assessment of leading and lagging indicators and how the portfolio can support them. I am sure there are other complex and wonderful interpretations of this, but to me this view is the simplest. Keep what adds value and has a low cost to operate. 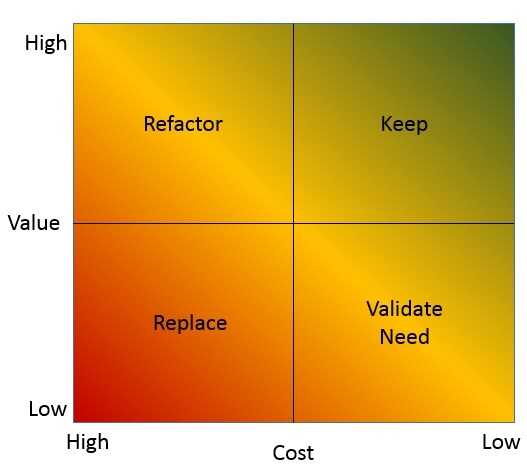 Refactor those programs (where possible) that have a high cost to maintain and also add high value. Validate the need for anything that delivers low value – you may be surprised how many of these you can turn off. Finally, replace those that have business support and high cost. In this age of automation, the concepts of cost need to be holistic and not just the IT maintenance costs… For a parity of Who Moved My Cheese? touching on automation look to this Abstruse Goose illustration. It is not hard to start but it is constantly changing so it may never be done. Significantly faster data speeds: 10 Gbps, compared to one gigabit per second (max) with 4G. 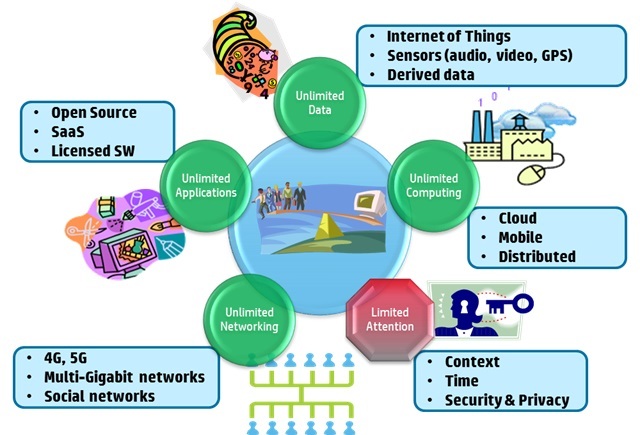 The foundation for a more “connected world”: The Internet of Things (smart appliances, connected cars, wearables) will need a network that can accommodate billions of connected devices. The most optimistic targets would see the first commercial network up and running by 2020, but even that may be too optimistic. 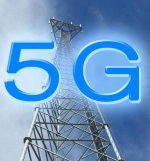 As with LTE, it will take years for the network to become widespread. What it will mean for businesses is the possibility for finer granularity across a wider geographic area. Hopefully, everyone is getting ready for IoT. It does make me wonder about the future of relatively low speeds that many regions have as their entry level broad band for the consumer. First it was Windows and now Office for free on small devices?!? I mentioned earlier this month my efforts to make a small Windows tablet useful. Now I see a story that Office will be free for small tablets, with an under 10″ screen size. This is definitely Microsoft making a statement that it is serious about getting a beachhead in the mobile space. I wonder if they have a way of checking to see ways of accessing the ‘display’ from other devices. Or if there will be limitations that only permit editing and not content creation — although that would be rather short sighted if their goal is demand creation. Since I have moved to a new blog site I decided to update a post on my foundational beliefs about IT, the future and what it should mean to business. A number of years back, I posted that the real value for business is understanding unique and separating what was abundant from what was scarce and plan to take business advantage of that knowledge. Today, there is an abundance of data coming in from numerous sources. A range of connection options can move the data around to an abundance of computing alternatives. Even the applications available to run on the data continues to grow almost beyond understanding. Various service providers and options even exist to quickly pull these together into custom (-ish) solutions. Yet there are elements of the business that remain scarce or at least severely limited by comparison. The attention span of personnel, the security and privacy of our environment and even actions based on the contextual understanding of what’s happening persist in being scarce. Part of every organizations strategic planning (and enterprise architecture effort) needs to address how to use the abundance to maximize the value from the scarce elements and resources – since each business may have its own set of abundant and scare components. For IT organizations one thing to keep in mind is: almost every system in production today was built from a scarcity model of never having enough compute, data… Those perspectives must be reassessed and the implications of value for the business that may be generated reevaluated, since that once solid foundation is no longer stable. The business that understands this shift and adjusts is going to have a significant advantage and greater flexibility.